The Tennessee Valley Authority turned 75 last week, marking 75 years since President Franklin Roosevelt signed into law legislation (sponsored by Sen. Norris - of *Nebraska*) that created a pseudo-governmental agency to stimulate economic growth, provide jobs to Appalachia (hardest hit by the Depression) and harness the power of the Tennessee River. Today TVA (the nation's largest public utility) provides energy throughout a seven-state region. And while hydrodynamic power was their initial charter, today hydro accounts for barely 6% - compared to 20% from their six nuclear plants, and more on the way. In the photo, Cong. 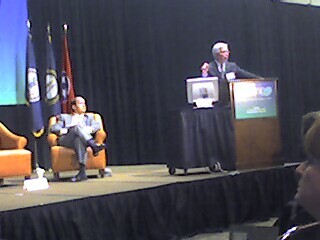 Zach Wamp [R-TN 3rd, on the left] listens as Jack Bailey (VP for Nuclear Generation & Development at TVA) tells about their efforts to (1) build new plants to meet growing demand in a carbon-neutral manner, (2) take advantage of the Nuclear Regulatory Commission's new "Combined Construction & Operating License" procedures, and (3) close the nuclear fuel cycle so that solid waste is minimized why fuel use is maximized. While I'm optimistic about the promise of microsolar and local (distributed) electricity generation, I believe that nuclear is an essential gap-filler while we await the commercial viability of mass-produced solar arrays. I figure that our electricity use (even after launching EMC2 LLC as a home-based business) is about 5-6kW 2-3kW steadystate, or 30 15 m^2 of solar panels with current photovoltaic efficiency and battery capabilities [Correction note: we use about 24,000 kWh per year, or 70 kWh per day; I have corrected my mental math errors above.]. Ironically our carbon footprint has diminished greatly - largely due to the lack of a daily commute. Technology, driven by consumer demand as the middle class in India and China grows in the coming years, will lead us to cheap, ubiquitous electricity in our lifetimes. 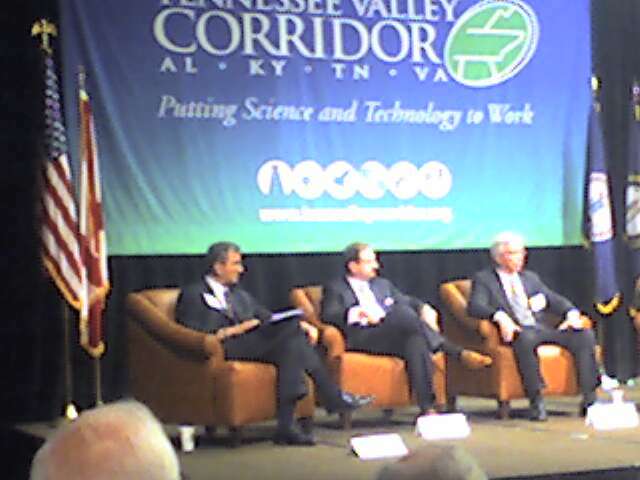 It is gratifying to see the dual-pronged approach of local and capital generation alive and well in the Tennessee Valley (which includes the Oak Ridge National Lab, where Dr. Dana Christensen - seated below on the left - is ably leading the Energy & Engineering Sciences Directorate).